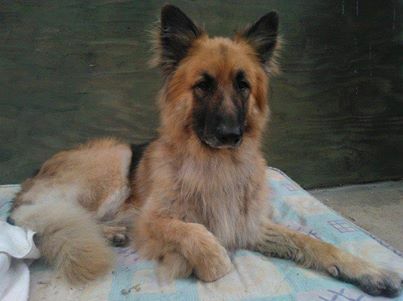 Almost 7 yr old Khan is still looking for a special forever home. He's currently lucky enough to be in foster care, but he's looking for a home where he can be the only pet, with experienced owners. Khan has not had the opportunity to socia...lise with other dogs much and will need continued positive training to help him with this, which we can offer support with. Khan is homeless due to his previous owners terminal illness. Khan was allowed a lot of freedom in the past (wandering in and out of the home at will) so will need a secure home, as he can open some doors, and it's not appropriate to let him wander unsupervised! Khan absolutely adores being with his people, loves affection, being groomed, and will wake you in the morning with a huge kiss. He walks well when using a gentle leader, and enjoys a ride in the car. Yes, he does have his faults, but don't we all, and we will be here to offer support and advice. If you can offer Khan security, stability and positive guidance in return for bundles of kisses and loyalty then call 07749 175023 or email dogs@rspcaessexsouth.co.uk Khan is neutered,vaccinated, micro chipped, worm and flea treated, and will come with 6 weeks free pet insurance.